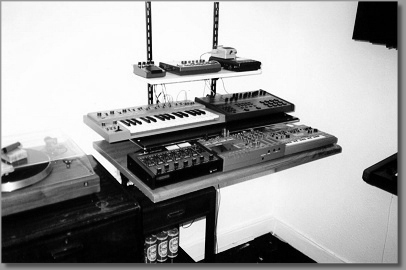 Early picture from 1987, SH101, MC202, VestaFire MR10B PortaStudio, MXR Drum Machine, Korg DDM110 Drums, Realistic Mixer, Boss DSD2 Sampling Delay Pedal, Flanging FX Pedal & the A&R Legend Turntable. 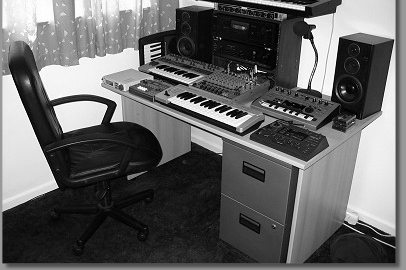 Similar to the first picture with the Juno 6 now in shot and to the keen eye in the bottom right hand-corner is the JEN SX1000 on the chair. Sansui D90 Cassette Deck, Sony amp & Graphic EQ. 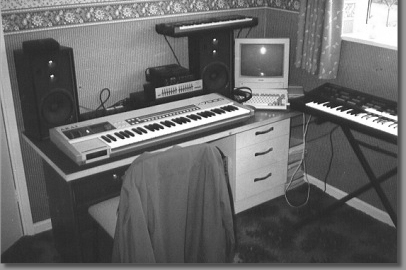 MC505 Groovebox, Tascam 488 MK2, there are actually three keyboards to the right of the image, Roland JP8000, Juno106 & a Korg N5EX. 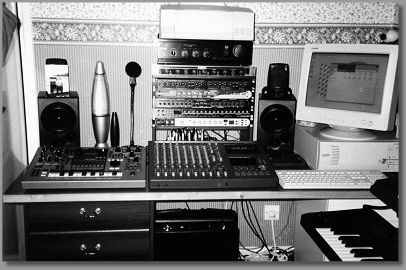 A Multitude of outboard gear and the Compaq PC. 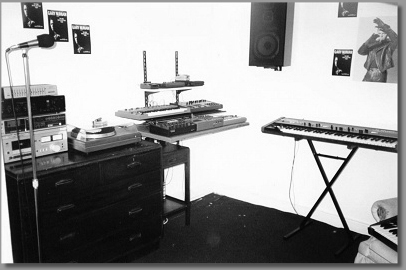 Yamaha RM1X, MC303 Groovebox, Korg Micro, Roland midi Controller Keyboard, Behringer Mixer with FX, Zoom MRS4 & the Kef Monitors. 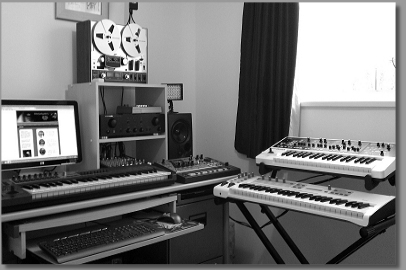 Similar shot to the previous picture with the addition of the Yamaha SU10 Sampler. 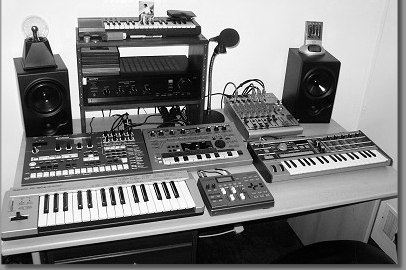 Fostex FD8, RM1X, MC303, JP8000, Korg N5EX & a new FX Rack. 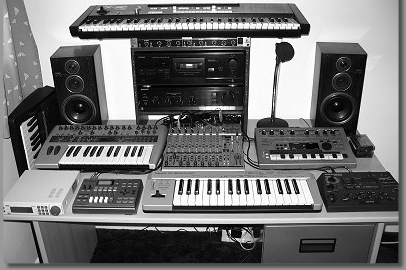 Novation K-Sation, Korg NS5R, MC303, Zoom Sampler & A Yamaha DJX tucked away in the corner.. 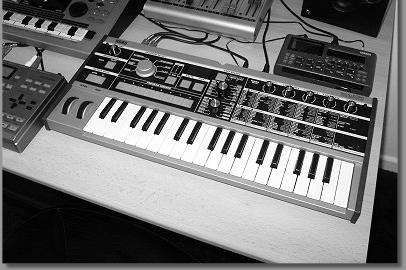 Same as previous picture just with the Roland JX3P in frame. Intel Core i7 Desktop. 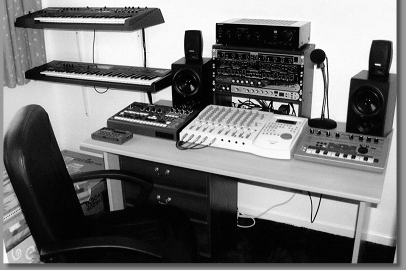 Marantz Amp, Kef Speakers and Roland PCR-500, MC307, Roland Gaia SH01, Venom Synth, AKAI 4000DS MKII.